Here's where to watch every episode of Kung Fu: The Legend Continues season 2. Mouseover or tap an episode to see where to stream it. Click or tap the play icon to stream it on the best available service. Return of the Shadow Assassin Jan 26, 1994 The shadow assassin has returned to Chinatown to seek revenge against Kwai Chang Caine. This time he has help. Guest Stars-Martin Kove, George Lazenby, and Gary Blumsack. Dragon's Daughter Feb 9, 1994 Tan's daughter has returned to Chinatown and is stalking young men in order to flush out her father's killer, Kwai Chang Caine. It is up to Peter and Caine to stop her. Guest Stars-Marla Suchantza, Jonathan Whittakar, and Sam Malkin. Ancient Lottery Feb 16, 1994 The Ancient wins the lottery with a ticket given to him as a goodwill gesture by a greedy developer and upcoming politician. Now Tan wants it. Guest Stars-Chuck Shamata, Joel Wyner, Amanda Tapping, and James Spiddel. Laurie's Friend Feb 23, 1994 Peter enlists the help of a young girl, who is psychic, to help find a gun that has been used in the murder of a cop. Caine discovers the girl has a psychic protector --- another Caine! Guest Stars-James Purcell, Heather Brown, and Linda Thomson. Temple Mar 2, 1994 Caine and Peter return to Braniff, wherein lies the temple were Peter grew up. They meet the widow of one of the priests from the temple. She needs their help since some very familiar townspeople are harrassing her and her son. Guest Stars-Kerrie Keane, Christopher Redman, Kevin Jubenville, Colin Fox, and Robert Collins. Only the Strong Survive Mar 9, 1994 Peter goes undercover in a Kung Fu tournament to help save a little girl who has been kidnapped. Guest Stars-Bo Svenson, Alex Carter, and Christine Reeves. Out of the Woods Mar 16, 1994 Peter takes a few days off work, and he and his father go camping. They come across a group of lost campers and an escaped criminal and his sons. Tournament Apr 20, 1994 An industrialist, who holds a grudge against Caine, sponsors a martial arts tournament. When Caine enters the tournament, Peter follows him, on a special undercover assignment. The Bardo Apr 27, 1994 Peter is wounded in the line of duty, but he cannot be operated on, because his life signs are fluctuating. Caine finds out that Peter's soul is being held in the Bardo, an in-between realm of memories, including those of Caine abandoning Peter. The Possessed May 4, 1994 The Church is trying to exorcise a man who is possessed. However, something goes wrong and the demon possesses other people, instead. Somehow, Caine gets involved and tries to help a troubled man who has been possessed. Warlord May 11, 1994 To save his father who is dying, a Chinese warlord insists that Caine use his healing skills to cure the warlord's father. The Innocent May 18, 1994 Caine is one of the jurors in a murder trial. He is the only juror who believes that the defendent is innocent. Magic Trick May 25, 1994 A magician at a nightclub uses magic to hypnotize and kill wealthy victims. Caine pretends to be a magician so that he can stop the killer. Aspects of the Soul Oct 12, 1994 Caine is contacted by Clarence Choi, who seeks friendship and forgiveness for his past attacks against Caine. Kundela Oct 19, 1994 Aborigines are angry about a land deal made by a businessman who happens to be the uncle of Peter's girlfriend. Pretty soon, aboriginal assassins appear on the scene. The Gang Of Three Oct 26, 1994 A group of two elderly men and a Chinese boy, recently back from college, decide to fight crime. 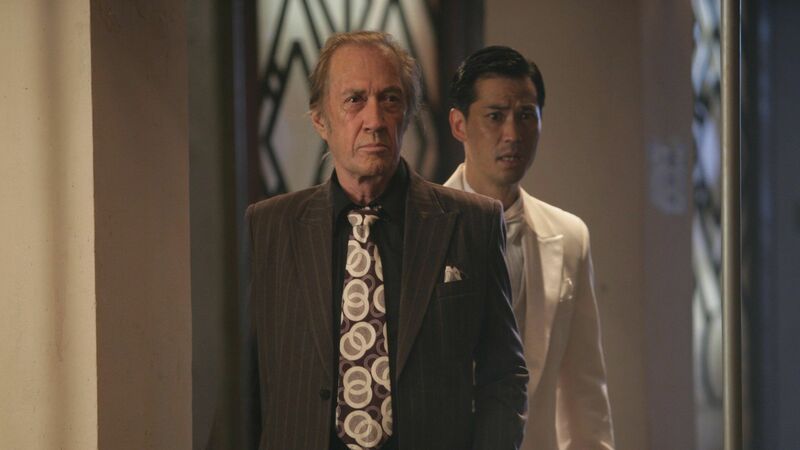 When they get themselves involved in a major robbery by notorious gang, Peter and Kwai Chang Caine must help them. Sunday in the Museum with George Nov 2, 1994 George, an expert thief, returns to steal ancient Chinese treasures, which unleashes a deadly curse. Dragonswing II Nov 9, 1994 The Dalai Lama and Caine are kidnapped. Will Peter be able to rescue them, with the help of two former acquaintances, who are mercenaries. Sing Wah Nov 16, 1994 A ruthless black magic cult, that uses an usual form of kung fu, tries to kill an archeologist because of a document he has deciphered. Enter the Tiger Nov 23, 1994 Peter and Caine come to the rescue of an impassioned Chinese dissident who is trying to help the democracy movement in his country. Retribution Nov 30, 1994 When a senator is killed at a Captain Blaisdell's reunion of his former commando team, Peter says he saw the captain kill the senator. Caine helps the captain find answers to this puzzle from an event that occurred in Blaisdell's past.